"Intrinsically, we are perfect in being as we are. We are englightened. But until we really understand this, we will do deluded things." Mon Mar 24. Charlotte Joko Beck, Nothing Special. Ch. 14, "Integration"
Tue Mar 25. Koan of the Week. "Nanquan Draws a Circle." Blue Cliff Record #69. Wed Mar 26. Shunryu Suzuki, Zen Mind, Beginner's Mind. Ch. 17, "Mistakes in Practice." Thu Mar 27. Thich Nhat Hanh, The Heart of Buddha's Teaching. Ch. 15, "Right Concentration." Fri Mar 28. Taizan Maezumi & Bernie Glassman, On Zen Practice: Body, Breath & Mind. Ch. 6, "What is Sesshin?" Sat Mar 29. Diamond Sutra (trans. Red Pine), chapter 6. Nanquan, Guizong, and Mayu set out together to pay their respects to the National Teacher Nanyang Huizhong. On their way [halfway there] Nansen drew a circle on the ground and said, "If you can say something, then let's go farther." 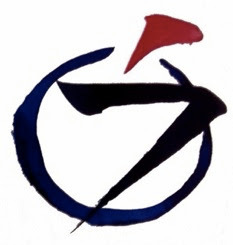 Guizong seated himself [i.e., in zazen posture] in the circle. Mayu made an informal bow. Nanquan said, "If it is so, then let's not go any farther." 2. Nanquan stops the pilgrimage and draws a circle on the ground. What might the circle represent? 3. Nanquan says, "If you can say something, then let's go farther." How do you answer Nanquan's question? 4. When Nanquan says, "If it is is, then let' not go any farther," is he approving or disapproving of the display Guizong and Mayu have made? 5. What does Guizong's final question reveal? Circling the tree, how exceedingly direct! Who has ever hit the mark? Calling them together, he beckons them, "Come, let's go back;"
The nothing I'd say: "Then let's go back." The "Koan of the Week" is drawn from these three koan collections. "Gateless Gate" (a.k.a. "Wumenguan," "Wu-men-kuan," "Mumonkan"). "Blue Cliff Record" (a.k.a.. "Biyan Lu," "Pi-yen Lu," "Hekiganroku"). "Book of Serenity" (a.k.a. "Book of Equanimity," "Congrong Lu," "Ts'ung-jung Lu," "Shoyoroku").